The Lord's Prayer is the best known prayer in the Christian religion. It is also known as the Our Father (the first two words of the prayer) and Pater noster (which is Latin for "Our Father"). It was not until the Protestant Reformation that it was called the Lord's Prayer. The prayer is spoken in two places in the New Testament of the Bible (Matthew 6:9-13 and Luke 11:1-4). Jesus' disciples asked him how they should pray. 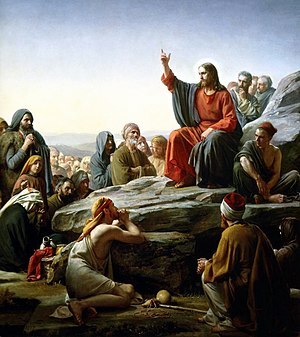 Jesus gave an example of how to pray to Father God. Our Heavenly father, may your name be glorified, may your kingdom come, may your will be done,in earth as in heaven.Give us today our daily bread.And forgive us our sins ,as we forgive those who sin against us .And don't tempt us, but save us from evil .Because the kingdom, glory and power are yours. For ever and ever. Amen. Pronunciation of the Lord's Prayer (Pater Noster) in Latin. Gregorian chant – Pater noster. Luigi Cherubini, Martin Luther, Die Toten Hosen, Charles Gounod, Leoš Janáček, Franz Liszt, Giacomo Meyerbeer, Otto Nicolai, Bernardino Rizzi, Igor Stravinsky, Pyotr Ilyich Tchaikovsky, Leonard Bernstein (in Mass), Giuseppe Verdi and Leonardo Schiavo. This page was last changed on 13 December 2018, at 19:15.